Handgun 1 "Ohio CCW- Concealed Handgun Training & Certification"
Personal Defense Systems offers 4 Levels of Handgun courses that are built upon tried and true modern handgun shooting instruction techniques. Our instructors have years and years of practical experience that they bring to the classroom and to the range. Our handgun courses have been developed by drawing on the depth of knowledge and experience from our instructors and from the top shooting schools found in the USA. Handgun 1 is our "Ohio Concealed Carry Training and Certification Course". This course will certify that you have successfully completed the required training requirements as required by Ohio Law to apply for a Ohio Concealed Handgun License (CHL) with your local Ohio Sheriff's Department. This course will give you a solid foundation of fundamental concepts and essential techniques necessary to develop substantial defensive mindset and efficient & consistent handgun handling and shooting skills. To learn more about our Ohio CCW course scroll down this page to the Handgun 1 description. Our Handgun 2 "Core Skill Builder" is a continuation of our Concealed Carry Series and is our second handgun course designed to build and integrate fundamental handgun skills and a combative mindset. If you hope to use a handgun to fight with you must take this core course. For more information on this course click here. In our Handgun 3 “Extreme Close Encounters - Combatives for Concealed Carry" integrates unarmed combatives and concealed carry tactics. We know that most confrontations happen at distances less than 10 feet and being able to access your handgun during a fight is a necessary skill you must have available to you. All of our classes build upon each other to provide you with the best defensive and tactical information available today. For more information on this course click here. Our Handgun 4 "Advanced Conceal Carry Tactics and Low Light Skills ” This course brings all of the skills and tactics taught in our handgun classes with an emphasis placed on the use of these tactics in low light situations. This course employs a variety of exercises that are designed to develop your gun handling skills and real world tactics. We utilize live fire training, scenario based training and force on force sessions on the range to reinforce skills needed to defend oneself. This class will start at 2 pm and run until 10 pm so we can train in low/no light conditions. This course, no matter what your training, will take you to the next level. For more information on this course click here! Our Concealed Handgun 1 course is a one day, 8+ hour introductory handgun course designed for beginning and experienced students. We offer multiple classes for handguns so we view this as your first step in your formal handgun training. This class meets and exceeds the educational and practical training requirements set forth by Ohio Law to obtain your Ohio Concealed Handgun License with your local county Sheriff. We will provide you with all of the information and tools you will need in order to complete this course. You only need to bring a good attitude and a willingness to learn. 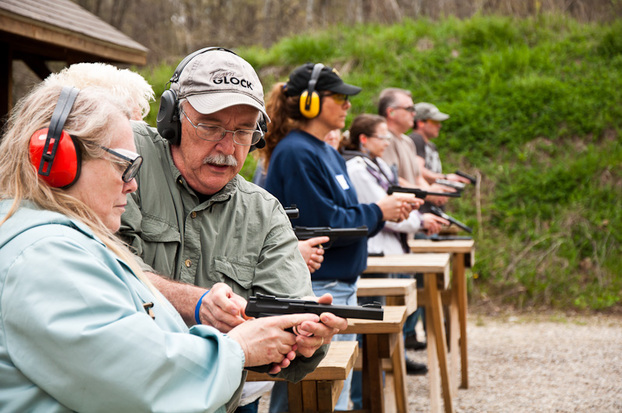 We offer CCW classes near Zanesville, Ohio 1 hr east of Columbus at a professional facility that offer state of the art shooting ranges and classrooms. Discounts for Couples: Our couples program is designed to encourage more couples to train together and for more women to take more responsibility for their own safety. Essentially, all women who attend our CCW class with a student paying full price will receive all classroom and range instruction for free but the difference in price between the single and couple prices is to help cover the cost of range fees, dinner and ammunition, range officer fees, etc. This is great program for traditional couples, father-daughters, brother & sister or even two ladies will qualify as a couple for our CCW class. Both parties must register at the same time. In order to take advantage of the "couples" pricing we require that one person in the couple must be female. This offer cannot be combined with other discounts. Please select the date and the option that best describes your situation from the drop down menus found below (single person, couple or deposit only). You can pay with any major credit card or use PayPal. Your PayPal receipt will be from "Ohio Shooting Sports". Don't forget to fill out one of our required REGISTRATION FORMS before leaving our site. We need your payment and registration form in order to process your request to attend one of our classes! If you would like to download a flyer for this class to share with a friend just click on the button below.